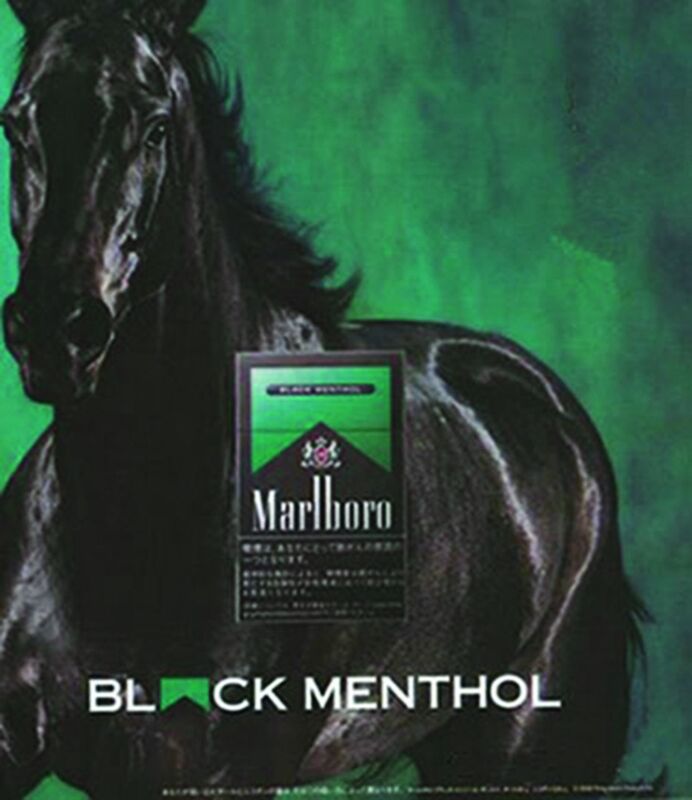 When Marlboro Black Menthol was launched in Japan, marketing communication for the brand depicted a strong black stallion in motion. The brand’s marketing communication in Indonesia and the Philippines also featured a black stallion. Intrafamily codes continue to be used to infer relative harm for PMI’s new brand architecture that includes Marlboro brand variants being offered in black-coloured cigarette packages. A hierarchy of relative harm is communicated on the basis of numbers and size of the Marlboro rooftop symbol. As seen in figure 2, Marlboro Ice Blast offerings both portray blue-coloured rooftops, but a larger rooftop is observed for the variant with a supposed tar yield of 6.0 mg, whereas a comparatively smaller-sized rooftop is used for the variant with a supposed tar yield of 1.0 mg. Moreover, to reinforce the importance of 1.0 mg being a low nominal tar yield, the smaller rooftop variant is identified as Marlboro Ice Blast One. When purchasing both variants of Marlboro Ice Blast at a convenience store in South Korea, the receipt pointed to the brand variants’ comparative machine-measured tar yields alongside the price (figure 3). As seen in figure 4, advertising at the point of sale explicitly identifies the comparative reported tar deliveries of the variants and highlights the different sized blue-coloured rooftops as a code for the corresponding reported tar delivery. In Japan, Marlboro Ice Blast variants are offered from a vending machine with reported tar yields of 8 mg, 5 mg and 1 mg and the cigarette packaging depicts numbers and sequentially different rooftop sizes to communicate comparative tar yields (figure 5). 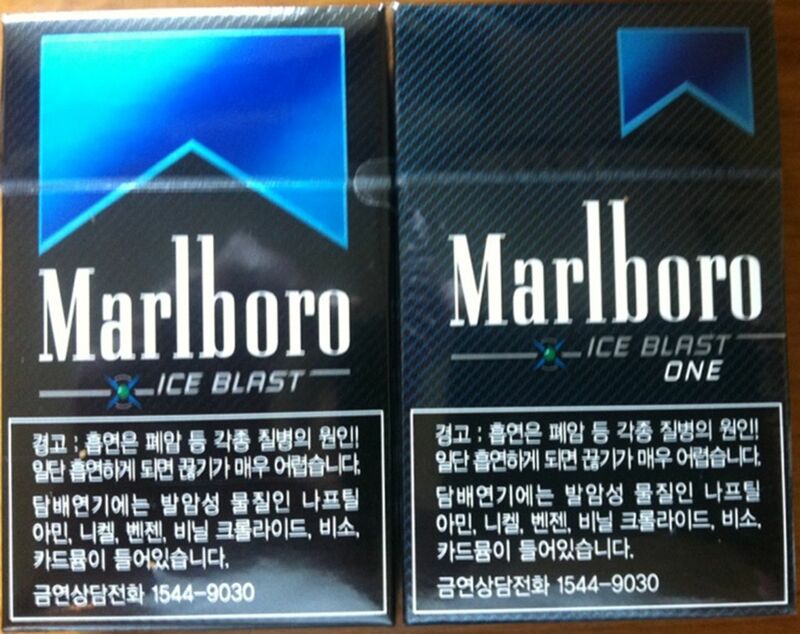 Cigarette packages for Marlboro Ice Blast variants in South Korea, where a larger blue-coloured rooftop is seen for the variant with a supposed tar yield of 6.0 mg and a comparatively smaller-sized rooftop is used for the variant reporting a tar yield of 1.0 mg. The size of the Marlboro rooftop serves as a code for communicating the relative machine-measured tar yield. 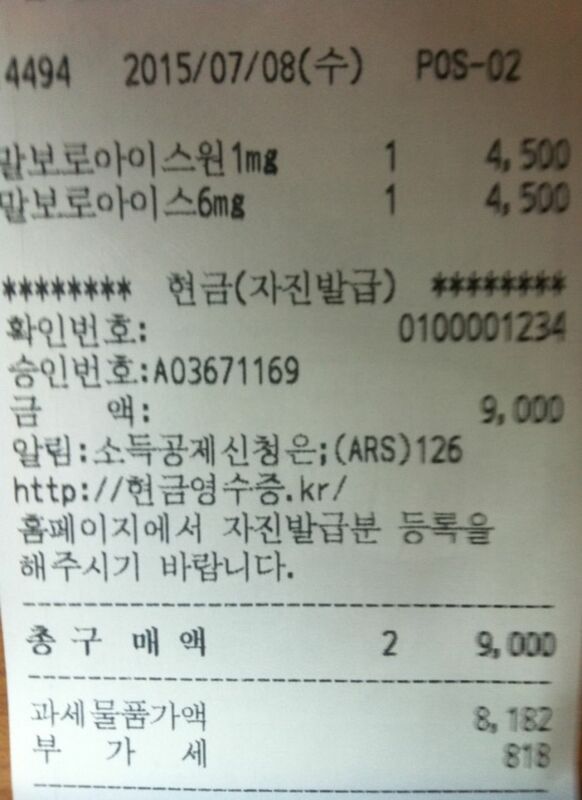 When the cigarette packages for Marlboro Ice Blast variants were purchased in South Korea from a convenience store during 2015, the receipt pointed to the price (ie, 4500 Korean Won (KRW), which is equivalent to nearly US$4) as well as the brand variants’ comparative machine-measured tar yields (6 mg and 1 mg). 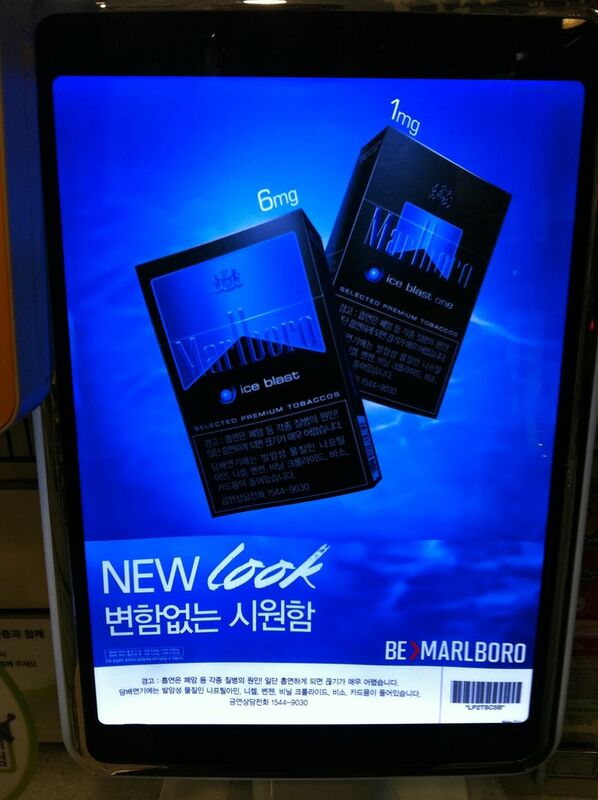 Point-of-sale advertising for Marlboro Ice Blast at a convenience store in South Korea, where ad copy refers to the brand’s ‘new look’ (in English), which presumably refers to the cigarette packaging, while indicating that the coolness, as experienced from the flavour capsule, remains unchanged (in Korean). The photo, dated 18 July 2015, was taken by Timothy Dewhirst. 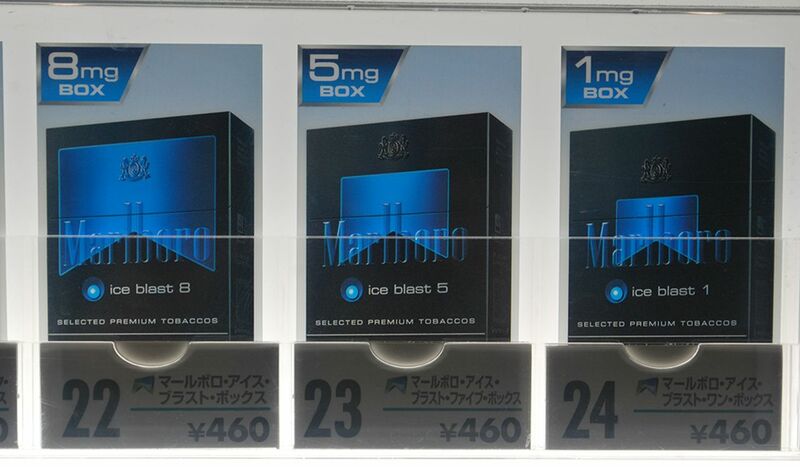 Marlboro Ice Blast variants available from a vending machine in Japan with reported tar yields of 8 mg, 5 mg and 1 mg and the cigarette packaging depicts numbers and sequentially different rooftop sizes to communicate comparative tar yields. The price is listed as 460 Japanese Yen, which is equivalent to slightly more than US$4. The photo, dated 1 November 2016, was taken by Timothy Dewhirst. The offering of variants and line extensions prompt the perception that there is a hierarchy of ‘strength’, based on sequentially reported tar yields, and thereby an apparent offering of sequentially ‘less harmful’ options from the parent anchoring brand. Advertising and promotions that point to a cigarette brand’s supposed low-tar delivery are regarded as misleading, however, as tar and nicotine yields generated for cigarettes smoked by machines are appreciably lower than the yields actually delivered to compensating smokers.16–22 Policy interventions to counteract tobacco companies from communicating a hierarchy of supposed relative harm within brand families include implementation of: (1) standardised packaging with one standard package colour and no imagery and design elements allowable (as observed in Australia) and (2) a single presentation requirement, which means that tobacco companies can offer only one member of a brand family (as observed in Uruguay). Thus, PMI, for example, can offer Marlboro Red or Marlboro Gold, but not both in Uruguay (the company can only offer one ‘Marlboro’). It remains the option of tobacco companies as to which brand variant they want to offer, but they are not allowed to offer multiple variants of a brand family, given that cigarette brand families are typically based on a hierarchy of reported tar yields with variants subsequently inferring a hierarchy of reduced harm. Philip Morris International. 2009 Annual report. 2009 https://www.pmi.com/investor-relations/reports-filings. Philip Morris International. 2008 Annual report. 2008:13 https://www.pmi.com/investor-relations/reports-filings. Philip Morris International. 2010 Annual report. 2010 https://www.pmi.com/investor-relations/reports-filings. Philip Morris International. 2011 Annual report. 2011 https://www.pmi.com/investor-relations/reports-filings. Philip Morris International. 2013 Annual report. 2013 https://www.pmi.com/investor-relations/reports-filings. Philip Morris International. Regulation of descriptors. Available at: http://www.pmi.com/eng/tobacco_regulation/regulating_tobacco/pages/regulation_of_descriptors.aspx.
. Coded to obey law, lights become Marlboro gold. NY Times 2010.
. Color: a course in mastering the art of mixing colors. New York: Jeremy P. Tarcher/Penguin Books, 2004.
. The complete color harmony. Gloucester, MA: Rockport Publishers, 2004. National Cancer Institute. Risks associated with smoking cigarettes with low machine-measured yields of tar and nicotine. Smoking and tobacco control monograph No. 13. Bethesda, MD: US Department of Health and Human Services, National Institutes of Health, National Cancer Institute, 2001.
. Changing the future of tobacco marketing by understanding the mistakes of the past: lessons from ‘lights’. Tob Control 2001;10:43–4. Contributors TD was the sole contributor to the writing and analysis of the study. Funding This work was supported by an award from the Institute for Global Tobacco Control at the Johns Hopkins Bloomberg School of Public Health with funding from the Bloomberg Initiative to Reduce Tobacco Use. Competing interests TD is an associate editor of Tobacco Control with respect to product marketing and promotion. He has served as an expert witness in tobacco litigation, including for governments, in countries whose policies are being challenged by parties under trade agreements.